A Tudor home is an English traditional design style that is both warm and comfortable; it was named for the Tudor monarchy who reigned from 1485 through 1603. You can recreate a Tudor interior even if the exterior isn't Tudor. The modern Tudor design is called "Mock Tudor" and is a very popular design choice. If you aren't a fan of wood - specifically dark wood - then the Tudor style is not for you. 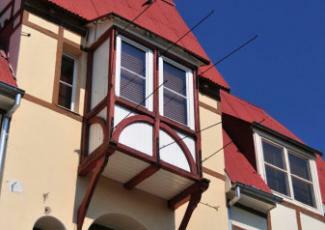 The Tudor style is immediately recognized by its use of stucco accented with dark wood rails. Tudor ceilings were also called cathedral since they mimicked those of Gothic styled cathedrals. Box beams stained dark served as both structural support and an aesthetic. 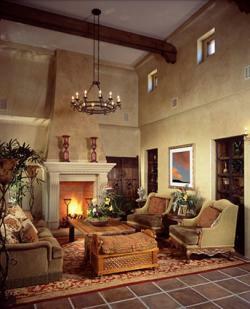 If you have a high-pitched or cathedral ceiling, then add authentic-looking wood beams. In today's décor, you can use faux beams that are lightweight and easy to add to a modern ceiling, although a high ceiling is best for this design treatment. Coffered ceilings were stained dark like the other woodwork. If you prefer, you can always paint the ceiling to avoid creating too dark a room. Ceilume sells coffered ceiling tile that can be installed with a drop ceiling grid in a variety of colors. Tilton Coffered Ceilings offers several options for customized ceilings. Some of the interior walls also repeated the stucco and rail look found on the exterior; however, the majority of the walls were made of stone and plastered over with wall paneling applied. In addition to the panels, you have several other options for creating an inviting modern home with Tudor style. 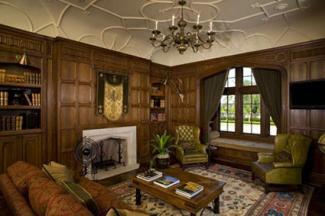 The epitome of Tudor style was wall paneling consisting of squares or rectangles. These were made mostly from oak that was stained dark. The paneling covered the entire wall height or two-thirds of the height in what's called wainscot. Prefabricated oak panels from Tudor Artisans can be made to your specifications and are also available in cherry and lyptus. While Tudor homes typically used a whitewash on the plaster walls, modern choices offer a large selection of colors. Choose a color that will help brighten the sometimes dark, drab effects from traditional Tudor design. 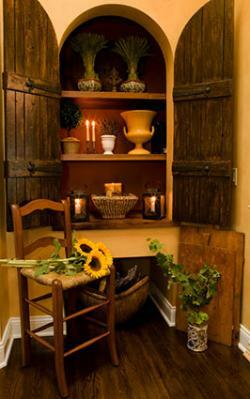 To contrast with the dark wood paneling, use equally warm colors from yellow, amber, gold, or red. To offset the intensity, paint the walls in a light hue with your warm color choice. Popular accent colors included various blues and greens. Fabrics & Papers sells Tudor Rose border wallpaper. However, it is a UK-based site, so keep this in mind when ordering. Steve's Blinds & Wallpaper carries a large selection of toile patterns and colors. Zoffany offers classic reproductions of damask wallpapers. Wallpaper Aficionado carries several colors and syles featuring the Tudor rose. The walls of Tudor homes also displayed tapestries and rugs that were hung on the walls. Lots of pastoral, hunt scenes, and other medieval designs, as well as Renaissance ones, are available through Medieval Wall Tapestry that you can use to accent your home's walls. Depending on the architecture of your home, you may be able to use an "oriel" window. This window style appears to float from the wall and is shaped like a bay window. It's supported by corbels and will give you space inside for displaying art objects, photos, or plants. Windows were typically mullioned. A mullion is a vertical piece of wood or stone placed between the glass pane units. This was used in cathedrals where the panes were arched, although rectangle shaped windows were also mullioned. The panes were leaded in a grid or diamond pattern or stained glass. Anderson Windows and Doors sells diamond and grill Tudor style windows. Going Lighting carries a Tudor stained glass in the classic color palette from Meyda Tiffany Lighting. In addition to wood panels, Tudor Artistans carries reproductions of Tudor geometric lead glass designs. Draperies were heavy and made of velvet or tapestry fabrics to block the cold drafts from windows. Matching curtains were often used over doors and surrounding beds to further block drafts. Textiles with patterns and appliques can provide detail in a room with dark wood and large furniture. Wayfair carries Tudor styles from Debage Inc. that includes a light colored net panel with appliques and a high sheen velvet option in brown, blue, and red colors with gold appliques. Inside Fabrics sells the Tudor Rose Licorice pattern that you can use in your design to infuse an authentic ambiance to your room décor. Decorative Fabrics Direct carries toile patterns in lighter colors that are also very popular for use in bedding, draperies, pillows, and upholstery. Brocades were also a popular pattern choice, so consider the black-gold fabric from Jo-Ann Fabric and Craft Stores. The flooring used during this era were wide plank oak floors, brick, and stone. Floors were covered with wool rugs. Home Decorators sells a porcelian-colored 100% wool classic Tudor design rug that's perfect for breaking up dark rooms and adding warmth to floors. Shades of Light sells the Tudor window grill pattern rug in several colors, making it a good option for a pop of color. Tudor furniture styles were made from local oak in a dark finish. 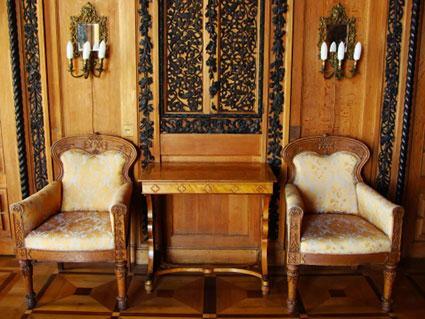 The heavy furniture was more ornate than its predecessors with decorations hand-carved into the wood. Four poster beds were the normal with the luxurious mattresses made from feathers instead of straw. Trestle tables were sturdy and large and often used with benches or upholstered high-backed chairs. Sideboards were all the rage and china plates could be displayed. 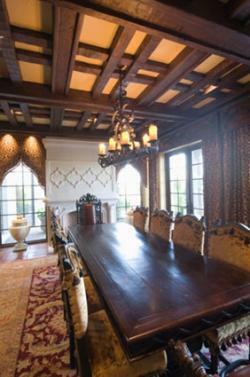 Purchase reproductions of the furniture from UK-based companies like Tudor Oak and Arttus. Just be sure you check their shipping, delivery, and pricing policies before placing an international order. Antique-lovers might want to check out 1stdibs, which highlights antiques available in your desired price range, category, location, and time period, on one website. Not just a focal point, the fireplaces was the hub of warmth in very drafty castles and homes. Mantels were ornately hand-carved with a slightly polished finish or made from stone or marble often with an arch motif. Chesney's Chiswick Tudor mantel is made from English Bathstone. Design the Space carries both Gothic and Tudor mantels. At Tartaruga Design Inc., you'll find Tudor arches and floral designs. Accessoring a Tudor home means seeking pottery and metal work. Select objects made from metal, such as pewter and wrought iron. Crewelwork, a type of embroidery stitch, was created for wall hangings and pillows. Everyone home had a family coat of arms displayed and pewter was the go-to metal for housewares, especially tankards. Steve Millingham Pewter Replica carries a multitude of medieval pewter replicas like cutlery and jewelry. Woodbury Pewter sells pewter candlesticks and bowls. Strongblade sells various tankards, goblets, and more. Zazzle has several modern takes on Medieval serving trays in bright patterns. 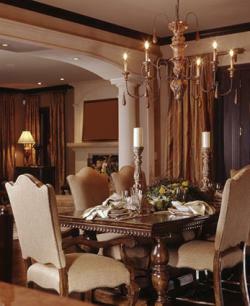 Ace Iron carries wrought iron custom chandeliers. Crewel Fabric World sells embroidered Crewelwork fabrics to make wall hangings and pillows. The lives of the Tudors were greatly improved with modern textiles and home fashions. Glass windows brought a new way of seeing the world and home interiors were rich with new housewares. You can enjoy this historical time period with any of these design options in your home.